Rejuvenate skin and reduce fine lines and wrinkles! The Vivite skin care kit is an advanced skin care regimen that will give you skin that glows from within. ORDER TODAY - FREE SHIPPING!! 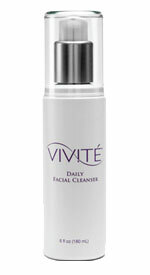 VIVITE Daily Cleanser Gently and thoroughly removes the surface dirt, grit, and makeup residues. Use daily to help keep skin looking fresh and to prepare your skin for regular application of VIVITE products. Contains 15% glycolic compound. To be used twice daily, morning and evening. 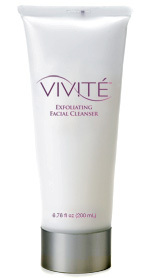 Vivite Exfoliating Facial Cleanser: Contains exfoliating microbeads and 15% Glycolic compound to gently and effectively loosen and dissolve the unproductive top layer of dead skin cells. Use the exfoliating facial cleanser 2 to 3 times a week to reveal fresh, new vibrant skin. 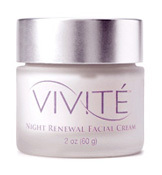 Vivite Night Renewal Facial Cream: Contains 20% Glycolic compound, Vitamin C, Vitamin E and superoxide dismutase (SOD), an advanced antioxidant. This extra-rich overnight formula promotes the repair and maintenance of skin tissues while you sleep. This rich antioxidant cream is light and soothing. To be applied once daily, in the evening. 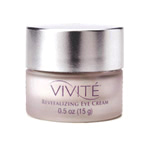 Vivite Revitalizing Eye Cream: Contains 10% Glycolic Compound, caffeine, peptides and interference pearls. Specially formulated for the delicate skin around the eyes, Vivite Revitalizing Eye Cream works to reduce the appearance of fine lines, wrinkles and dark circles while reducing puffiness and inflammation. Peptides tighten the skin around the eye and the interference pearls reflect and diffuse light to improve appearance of dark circles, wrinkles and fine lines. Apply twice daily each morning and evening. Vivite Daily Antioxidant Facial Serum: Contains 15% Glycolic compound, green tea, pomegranate and licorice (all noted for antioxidant properties) as well as aloe and chamomile to sooth and soften the skin. Use serum once daily in the morning to reduce the appearance of fine lines and wrinkles and provide your skin with superior antioxidant protection against the signs of premature aging. Regular application provides continued exfoliation, hydration and renovation to the top skin layer. Perfect for under your makeup. VIVITE DAILY ANTIOXIDANT FACIAL SERUM 1 oz. The Vivite skin care line exfoliates hydrates and protects your skin with a proprietary blend of glycolic acid and natural antioxidants known as GLX Technology. Vivite skin care products also contain an abundance of natural botanicals, antioxidant vitamins and advanced ingredients to help you look and feel your best. Vivite is suitable for all skin types and even those with sensitive skin will benefit from improved hydration and smoother skin texture. The Vivite products are gentle, do not contain harsh chemicals are easily absorbed into your skin and smell great. The Vivite skin care regimen is simple and the Vivite Skin Care Kit comes with everything you need for fresh, healthy looking skin.